I do this periodically, I ask my son what he wants as an adult. Mostly because I enjoy his answers, and kids with ADHD and/or autism are honest and straightforward in a way most adults will never be. For a hot second I was happy, thinking it was sweet of him to say he wants to stay with me forever. But a second later, I felt a knot forming in my stomach. Picturing my son at 35 in his batman underwear playing video games in my basement, I started to feel nauseated. What if he never leaves my house? What if he becomes a momma’s boy? I want my child to have the desire to go out and make his own way in the world. I don’t want to decide what he should think, where he should go, and who his friends are forever. So why am I trying so hard to control what he thinks, where he goes, and who his friends are? Because I am a control freak parent trying to get my child to do what I want him to do. Wayne was right, I don’t want my child to be a boring, insecure people pleaser. Do you? I think not. My advice: Stop telling your children what to do, how to think, and who to be. What feels like ages ago, I wrote an article with some of my favorite conversation starters. I still believe pretty strongly that having conversations with your children is important. And it’s not always going to go the way you wish. My son will argue and contradict, or flat out tell me it’s none of my business. Of course I am annoyed with his lack of social skills. But I persist in asking questions about school and about life because I want to hear his opinion. I don’t expect him to do exactly what I would do. He is not me. Ask your kids questions, and listen. Try not to debate, but understand how they see the world. At some point your child will ask you why about something. A “why not?” question is even more likely. Kids have a BS meter, so they know if you are making it up as you go. Why not just admit you don’t know why the sky is blue? My son asks me why all the time, about everything from why he should control his tone of voice, to why I make certain decisions around the house. Admitting that I don’t know, makes him more willing to talk about it. If you say, “Because I said so” or “That’s the way it is,” You are opening yourself up to an argument. And you are being authoritarian instead of authoritative. Admit it, you do not want to watch your child try something and fail. Me either. But failure is part of life. And failure is one of those things that can actually help your child develop more resilience. For two years my son insisted that he wanted to play soccer. So I enrolled him, even though the first year he spent more time crying and/or screaming at his teammates than he did playing. The coaches were very understanding, and I think they knew why I was continuing to show up with my child throwing tantrums and embarrassing me. I did it because he needed to make the decision on his own through failure. He wasn’t good at soccer because he has poor motor skills. He also wasn’t good at soccer because being on a team requires communication between members. Autism/ADHD makes both of these requirements quite difficult. He made the decision himself the next year that he didn’t want to try out for the competitive team. My son wasn’t embarrassed about his failure because he had learned through the experience that soccer wasn’t his sport. Let them make choices and be in charge of themselves. If your child refuses breakfast before school, allow him to go to school hungry. I promise he will not starve to death. Give choices instead of arguing over every little thing. For example, I often ask my son if he would prefer 40 or 45 minutes to play on his NintendoDS. I ask knowing that he will choose 45 minutes, and I am ok with it. He feels like he is in control, like he is self-directed. If I decide for him that he can have 40 minutes, I am removing control. I also allow him to create a plan on Sundays. Usually he plans to play video games, play in his room, and take a nap. He makes self-directed decisions about what he is going to do with his time. Do I love his plan? Nope. But often, he is forced to reconsider the plan and make adjustments based on what the rest of the family is doing. Making their own decisions, adjusting, adapting – that is what you want. Terrible things happen every day. My son does and says things I don’t like pretty much every day. But nothing he has ever said or done has made me distrustful of him. I tell him all the time, I trust you and I believe in you. When you tell your child what to do and you expect obedience to your expectations at all times, your child knows you do not trust them to think for themselves. You are also indirectly sending the message that doing what you expect, is more important than their expectations for themselves. If your child is not invited to a birthday party, do they really care? Chances are, they didn’t even notice. You noticed. Rejection offers a unique opportunity to teach your child that not everyone has to like you and that is perfectly fine. When we are rejected as adults we make all sorts of assumptions, namely that we were actually rejected. Half of the time the perceived rejection was an oversight. But sometimes in life there is real rejection, real criticism of our abilities or our sense of self. Show your children that rejection stings, but then it passes. Feelings are temporary. Teach your children hurt feelings don’t last forever. And it is ok to reject other people or create boundaries, as long as it is done in a compassionate way. Boundary setting can be modeled at a young age. I have ADHD. I need to deal with my own problems in order to be a better parent. Many of the issues and dilemmas we face as parents come from our inability to deal with our own STUFF. Trying to control another human is a losing battle. Your child will never be exactly who you pictured. 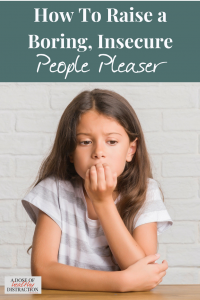 If you are a people pleaser, ask yourself how you came to be that way. Consider how you can raise your child to be a compassionate trailblazer. See a therapist. Take medications if you need them. Do what you need to do to take care of yourself. Talk about your personal history with your child, and how it contributes to your parenting style. Tell stories about your childhood. Apologize when your own issues take over and you say/do something unfortunate. It’s ok to admit you don’t know all the answers. In fact – most children respect adult honesty much more than adult authority. Stop telling your children what to do, how to think, and who to be. Your children will become exactly who they were meant to be, if you let them. I am not a parenting expert, but I learn as I go. I do consider myself an expert on living your best life, and parenting to the best of your ability, WITH ADHD. Join my list, I try not to send anything annoying. Get My List of Favorite Blogs and Web Resources! Wanna support my work? Check out my product page.